Living in the Midwest in the United States means my access to Japanese candy is somewhat limited. Some brands, like Lotte or Meiji, are fairly easy to come by, but I can't ever recall seeing Nobel candy around here. I'm not familiar with Nobel at all, but since I don't live in Japan, nor have I ever, it's no surprise. 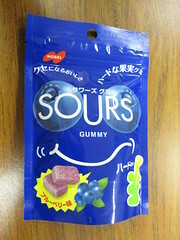 So, without any brand knowledge, I didn't know what to expect from Nobel or these Blueberry Sours Gummies. Had I read the bag before digging in, I would have noticed that the front of the package says they're hard. Twice, actually. These are the firmest gummies I've ever had. They were so difficult to chew! I can't really fault them for that, since it's written on the package, but I really wasn't expecting such a firm texture. It's not what I prefer in a gummy. The blueberry flavor was mild but fairly authentic, but these weren't even slightly sour. They might qualify as "mildly tart" but even that is a stretch. The dominant taste was sweet, and the gummies left a film in my mouth after swallowing. 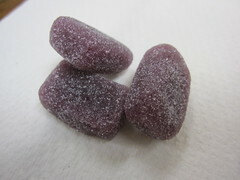 Even with fair warning about the hard texture, these gummies were a big disappointment. Hi, I enjoying reading your blog whenever I can find my free time. I am living in Japan , I recommend trying Seishun(Young age)shikekik grape from UHA. Thanks for the comment, and for the recommendation! I love many candies by UHA, so I will look for the ones you recommended. Out of curiosity, where did you actually find this candy? I won it from a raffle at a university event, but it was purchased in Japan. I'm not sure what store.